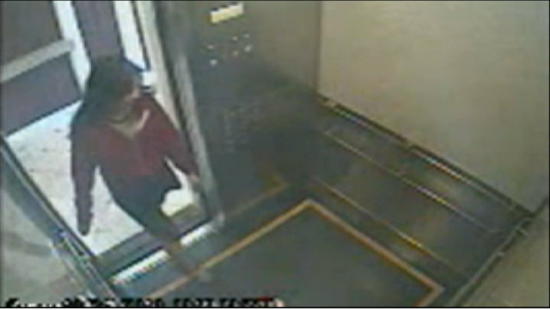 Elisa Lam (LAPD); Cecil Hotel in 2011 (Google Maps). The LAPD on Monday released another photo of 21-year-old Elisa Lam, a Canadian of Chinese descent who was reported missing. Lam was last seen on Jan. 31 at the Cecil Hotel, 640 N. Main St. between Sixth and Seventh streets in downtown Los Angeles. She was traveling alone from Vancouver, British Columbia, and arrived in Los Angeles on Jan. 26. Her final destination was Santa Cruz. The LAPD has also released surveillance video showing Lam entering an elevator in the hotel, pressing several buttons, and exiting the elevator. Lam is also seen outside the elevator making strange hand gestures. At times she appears to be looking for or hiding from someone, but does not look frightened. She never checked out of the hotel, and investigators have gone through her room in search of clues. Lam has been taking public transportation, including Amtrak and buses. Her family was in daily contact with her until Jan. 31, and police fear she may have met with foul play. Accompanied by her family, the LAPD released a photo of Lam at a press conference on Feb. 6. The family has declined to speak to the media. Lam is 5 feet, four inches tall, weighs 115 pounds, and has black hair and brown eyes. She speaks English and some Cantonese. She may suffer from mild depression. Anyone with information on this case is asked to contact Detectives Wallace Tennelle and Greg Stearns at the Homicide Special Section, Robbery-Homicide Division, at (213) 486-6890 during regular business hours (Monday through Friday, 8 a.m. to 5 p.m.). During non-business hours, including weekends and holidays, contact the Detective Information Desk of RACR (Real-time Analysis and Critical Response) Division at (877) LAPD 247 (527-3247), a 24-hour, toll-free number.